You may have noticed a new look at UBC Library. This week we unveiled a new homepage, featuring redesigned sections of its site, including the Research Help and Use the Library portals. 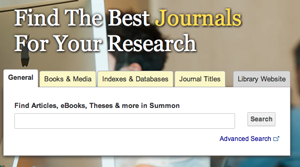 Over the past year, Joseph and LSIT have launched several new portals, including Search, Hours and Locations, and the newly revamped Get Research Help and Use the Library portals. 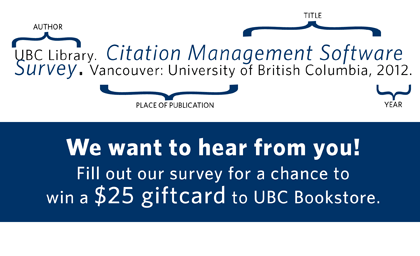 In April, LSIT, along with the Library’s Web Services Working Group, opened a Library homepage survey for members of the UBC community (students, faculty, staff, alumni, and those with an affiliation to the University). The survey encouraged feedback on the existing layout and offered opportunities for constructive criticism. In addition, several one-on-one sessions with faculty, focus groups (including students), and regular user testing offered continuous feedback and improvements for the proposed designs. More than 120 users were consulted and tested and the resulting data directly impacted the design of the homepage. “The best way we can serve our users is to design and develop iteratively in response to their feedback and experiences during testing,” says Joseph. The new site reintroduces drop-down navigational menus, and a highly improved search box, which offers tips for users to help improve their search method. The “breadcrumbs” feature, which offers users a visual trail of where they have been, is being implemented across the entire Library site. In addition to a site-wide content clean up, the homepage “clutter” has been reduced due to an overwhelming response from users that the old homepage was too crowded. A new “Login” button on the main menu allows users to login quickly and access their Library Account (to renew books online, check document delivery and more), EZproxy or Refworks. Check out some of the comments and reactions to the new design on social media. In the meantime, we value your input. Please provide your comments via the “Feedback” button on the homepage. The Library is looking for more feedback to improve its homepage website design. 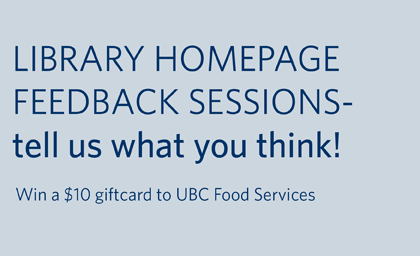 There are three upcoming opportunities for feedback – open to all members of the UBC community (students, faculty, staff, alumni and those with an affiliation to the University). 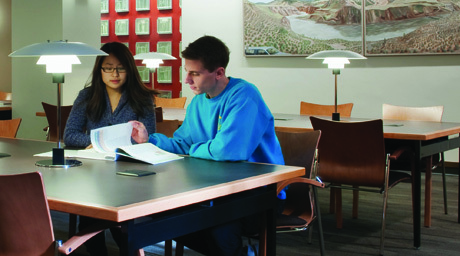 The feedback gathered will be used to help in the redesign of the Library’s current homepage. 15 participants will receive a $10 gift card to UBC Food Services. Advance registration for the sessions is required. All sessions will be held in the Irving K. Barber Learning Centre, room 272 (Gold River Room), next to Ike’s Cafe. Friday, April 27 from 11 a.m. to 12 p.m.
Monday, April 30 from 2 p.m. to 3 p.m.
Monday, April 30 from 3:30 p.m. to 4:30 p.m.
Those wishing to provide additional feedback are encouraged to contact John Chan, Library Systems and Information Technology, for future opportunities.